Inventors have been trying to create awesome virtual reality video games for years. 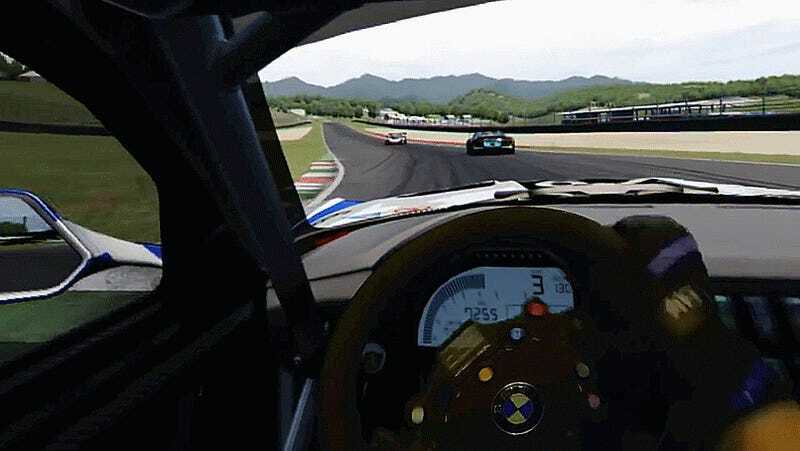 But now that you can create a decently immersive virtual experience with your phone and a piece of cardboard, an off-the-deep-end racing sim that fits on your shelf feels almost within reach. What you’re seeing here is sort of an imagination of what VR racing could feel like– it’s an Oculus Rift powered game enhanced and showcased to us mere mortals watching it on a computer via the same kind of green screen Hollywood uses to put actors in front of fantastical settings. YouTuber Marcel Pfister calls it “mixed reality,” and says he can’t actually see the wheel while playing. But his channel has some pretty cool visualizations about how VR and a few key physical items can bring a simulated driving experience to a pretty extreme next-level. Driving games are uniquely suited to VR because sitting down makes sense in the context anyway. Something like Call Of Duty might feel strange in full immersion when you’re “running around” but also sitting, driving games don’t have that problem. Your inner ear might get a little wigged out when your body isn’t jolted around with g-forces, but maybe that would make race-pace wrecks less traumatic anyway. Check out a few more examples of this awesomeness in action, and pray for a day when we can drive anything, anywhere, from our couches! Man, what a time to be a car-gamer. Hat tip to Alltime Gaming!